Hammock is the ambient/post-rock project of composers Marc Byrd and Andrew Thompson. With no agenda, expectations, or even intention to release music, guitarists Marc Byrd and Andrew Thompson began getting together as a way of letting the sounds inside of them find their way out into the open. Byrd describes it this way: "There are times when the need to create a thing begins to interrupt your life. And if you don't give in to it, everything else starts to suffer." With no agenda, expectations, or even intention to release music, guitarists Marc Byrd and Andrew Thompson began getting together as a way of letting the sounds inside of them find their way out into the open. Byrd describes it this way: "There are times when the need to create a thing begins to interrupt your life. And if you don't give in to it, everything else starts to suffer." After about a year of sporadic sessions, Byrd and Thompson began to gather up all of the recordings - which were strewn about on everything from cassette recorders to hard drives to two-inch tape - and were surprised to discover that they had around forty pieces of music. Out of this pool of songs came their 2005 debut Kenotic, which introduced audiences to their densely textured aesthetic and shimmering guitar-driven compositions. Theirs is a unique sound - it is ?sleepier? than the often-brash crescendos of their post-rocker cousins, drawing from the ethereal minimalism of Stars of the Lid and reminiscent of 80's Brian Eno and Nick McCabe of the band The Verve. Byrd and Thompson describe it simply as "Southern Ambient", citing the wide-open spaces of the South's rural landscape as an all-pervading influence in their music (Byrd's nickname in Arkansas was "Marc Marc Marc" because of his delay-drenched guitar sounds). Although hailed as a classic in the shoegaze genre, Kenotic revealed a band inspired by many different musical styles, from electronic, ambient, minimalism-drone to post-rock. Byrd and Thompson expanded on their unique amalgam of these sounds on their next release, the July 2005 EP Stranded Under Endless Sky. 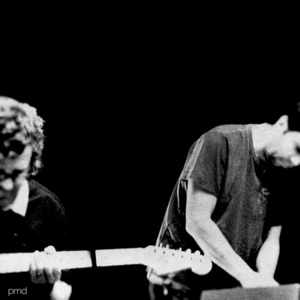 What followed eight months later was somewhat of a stylistic turn for the band, the heavily conceptual longform drone-influenced album The Sleepover Series, Vol. 1 (Remastered). November 2006 saw the release of the band's proper sophomore LP, Raising Your Voice...Trying to Stop an Echo, an album frequently hailed for its canny fusion of melodic accessibility and intrepid experimentalism. The band was attracting consistent acclaim from influential media such as Pitchfork, BBC, The Wire, and NPR, but most meaningfully to Byrd and Thompson, also from artists they admired like Mark Eitzel (solo and AMC), Brian McBride and Adam Bryanbaum Wiltzie (Stars of the Lid), Steve Kilbey and Tim Powles (The Church), BT, The Antlers, and Jonsi and Alex. In Fall 2007, Hammock was invited by Jonsi Birgisson (Sigur Ros, solo artist, Jonsi & Alex) and Alex Somers (Parachutes and Jonsi & Alex) to perform at the overseas debut of their art collaboration, Riceboy Sleeps. This created confluence of firsts for all four artists, as it was to be Hammock's first-ever live show. Byrd and Thompson wrote new music especially for the occasion, and these songs would ultimately become Maybe They Will Sing for Us Tomorrow, a "studio performance" album of the music they played at the Riceboy Sleeps premiere. Birgisson and Somers as Riceboy Sleeps created the artwork for the album. Chasing After Shadows...Living with the Ghosts followed in May 2010, along with a freestanding four-song Outtakes EP. Darker, heavier, and more massive sonically than Hammock's previous releases, the album was mixed by Tim Powles of The Church and features the duo's first usage of a horn section, string quartet, and live drums. David Altobelli's influential video for ?"Breathturn"? was released in late March 2010. Chasing... was praised by BBC as "one of the most beautiful albums of the year" and received accolades from Pitchfork and PRI-syndicated show "Echoes", where it was named #1 in its "Best Albums of the Year" list. On December 14, the duo released the EP Longest Year, a beat-less and wordless "mini-album" held for release until the dead of winter and whose title referenced the band's difficult 2010 (which included the near-total destruction of Byrd's home by an epic flood the likes of which had not been seen in Nashville in over 100 years). The previously mentioned digital-only EP of outtakes from the May 2010 LP, Chasing After Shadows...Living with the Ghosts, contained four songs, two of which were tagged with "instrumental" in the titles even though no other versions existed. That changed on October 25, 2011 with the release of the EP Asleep in the Downlights, which features vocals and lyrics from Steve Kilbey and Tim Powles of The Church and two new songs from Hammock. Departure Songs, the band's first double album and fifth LP, was announced on July 6, 2012 with the release of "Tape Recorder", a video from David Altobelli. The official release date for Departure Songs is October 2, 2012. Josh Varnedore with Hammock: 186,000 endings per second from the album Sun Chapter (released June 2012). Remix of "Borrowing the Past" by Rhian Sheehan : released February 23, 2012. Remix of "The Obeisant Vine" for inclusion on a Helios remix album to be released in early 2012. Marc Byrd of Hammock and Brooke Waggoner : "Parkers Chapel"
For Nihon : Charity album to benefit victims of the devastating earthquake and tsunami through the Japan Earthquake Relief Fund set up by New York's Japan Society. Released April 2011. BT Featuring Jes : Every Other Way: Hammock Reinterpretation (Remix). Amman Josh Featuring Hammock (Places album) and a new track with Josh featuring Hammock coming in 2012. Never Lose that Feeling (cover of Catherine Wheel's Black Metallic). 8/3/2007 (Live Debut) : US Premiere Art Exhibition of Riceboy Sleeps (Jonsi Birgisson, solo artist and Sigur Ros, and Alex Somers, Jonsi and Parachutes) : Hot Springs, AR. 5/4/2008 : w/Stars of the Lid : IOTA, Washington DC. 5/6/2008 : "Living Room Concert Series" for PRI-syndicated show Echoes (performance and interview series broadcast on the show's 130 NPR stations) : Philadelphia, PA.
5/10/2008 : Grimey's Records In-Store Performance : Nashville, TN. 11/21/2008 : w/Stars of the Lid (two shows) : Wordless Music Series, Le Poisson Rouge, NYC. 11/22/2008 : w/Taylor Deupree (two shows) : Monkeytown, Brooklyn, NY. 10/17/2009 : The Gatherings Concert Series (Hosted by "Star's End", the longest-running ambient music show, started in 1976) w/Mico Nonet : Philadelphia, PA.
10/24/2009 : Maxine's w/Amman Josh : Hot Springs, AR. 9/11/2010 : Maxine's : Hot Springs, AR.